Forensic Criminology gives students of criminology and criminal justice an introduction to the forensic realm and the applied forensic issues they will face when working cases within the justice system. It effectively bridges the theoretical world of social criminology with the applied world of the criminal justice system. While most of the competing textbooks on criminology adequately address the application and the social theory to the criminal justice system, the vast majority do not include casework or real-world issues that criminologists face. This book focuses on navigating casework in forensic contexts by case-working criminologists, rather than broad social theory. It also allows criminology/criminal justice instructors outside of the forensic sciences the ability to develop and instruct a core course that might otherwise be considered beyond their expertise, or in conflict with forensic courses taught in chemistry, biology, or medical programs at their institutions because of its focus on criminology and criminal justice careers. 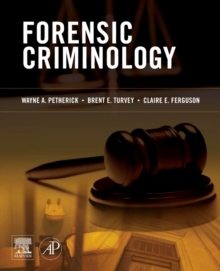 With its practical approach, this textbook is well-suited for forensic criminology subjects being taught and developed in law, criminology, and criminal justice programs around the world.